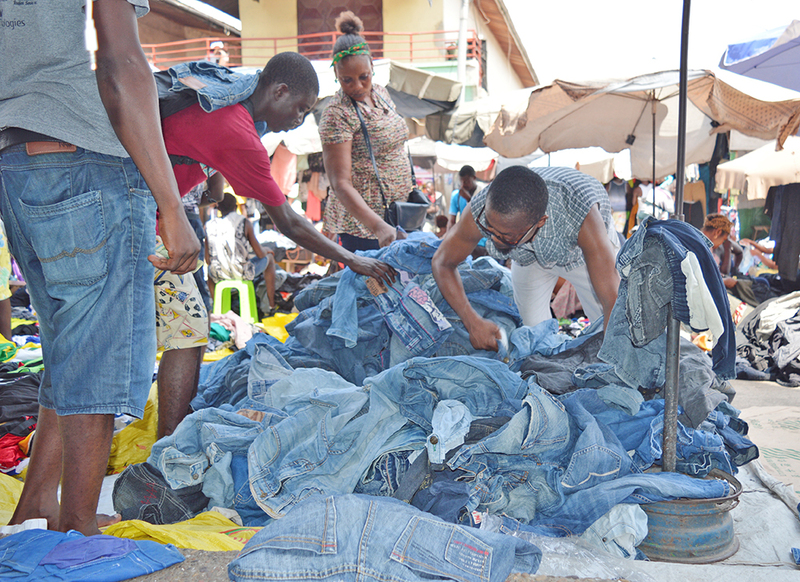 A young man selling first selection denim that his boss buys from other traders. In this case first selection consists of denim for the teenage/early 20s market - colored and patterned slim fit. Each pair sells for roughly 4USD. 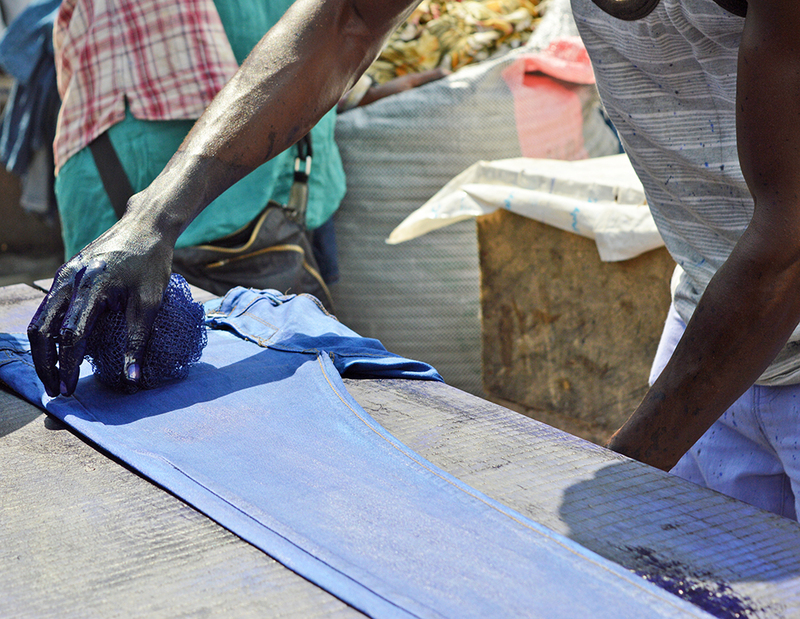 A team of 10+- people work six days a week to upgrade second and third selection denim by dyeing and starching pants with dark blue or black dye sourced from Nigeria. 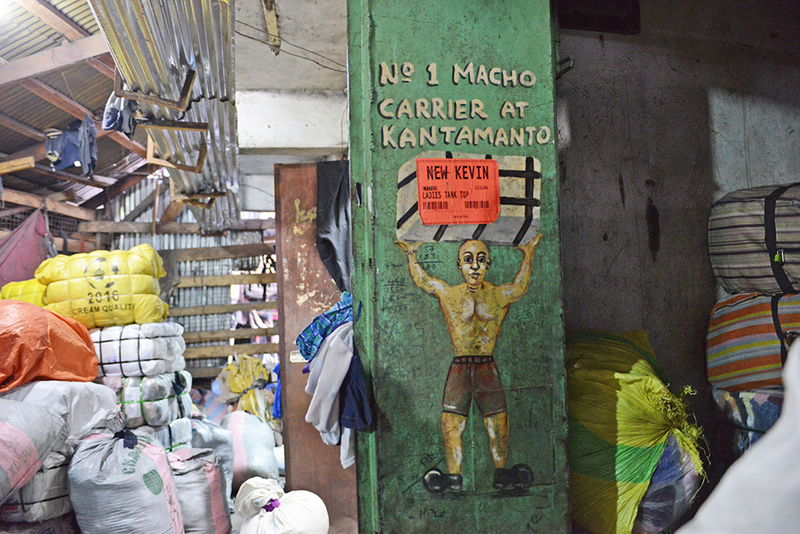 Kayayei, or head porters, carry the weight of Kantamanto. 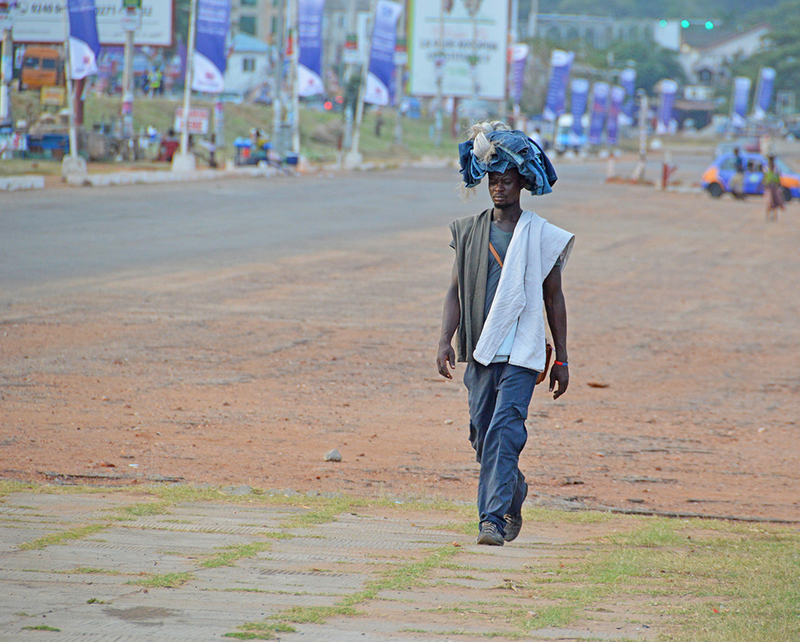 The Kayayei carry the clothes from location to location, often over a mile in distance, winding through the densely packed roads and narrow aisle ways of the market. These bales weigh between 120 - 200, pounds causing neck and back pain. Despite their vital role in the second hand clothing trade, the Kayayei are underpaid, receiving around $0.50 USD to carry a bale one mile. From this money they must pay for rent and food. 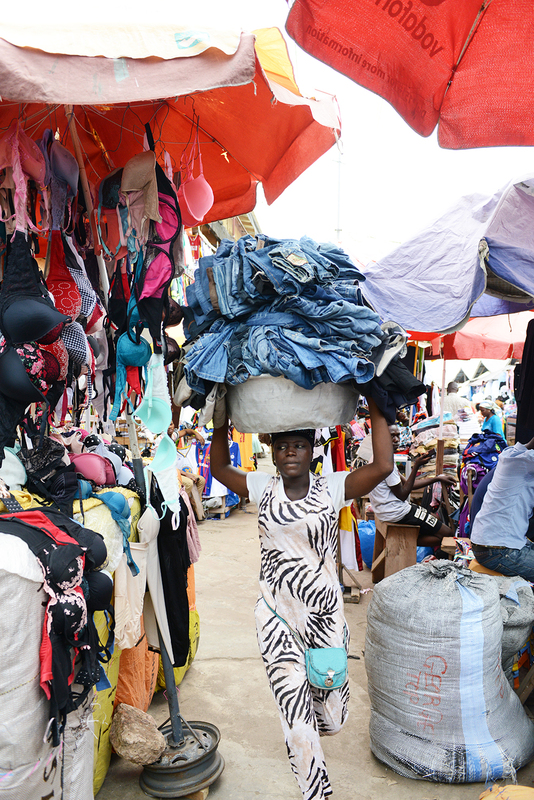 The Kayayei working at Kantamanto are mostly women and may find themselves in debt slavery. This woman is carrying second selection (less desirable) denim to be re-baled and sent to a second hand clothing dealer in Burkina Faso. A consumer checks the tag for brand and size information. The market is divided into several sections. 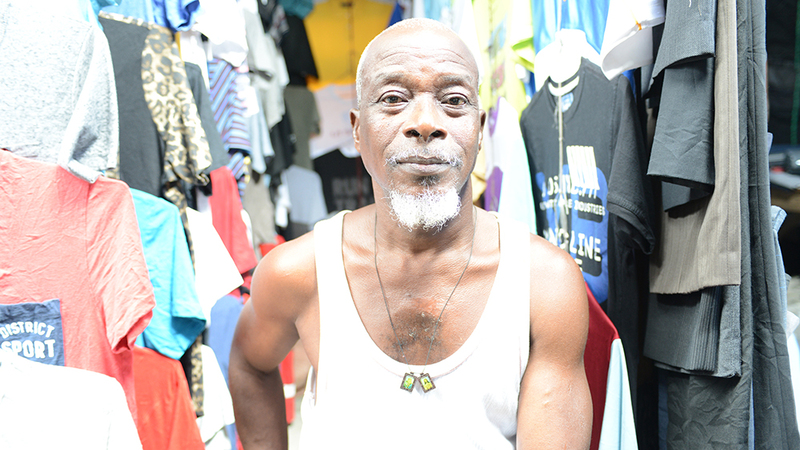 One of these sections is the 'original side' where many retailers and their families, including this man, have been operating for over 25 years. This part of the market is considered more upscale as it features more permanent structures with gated stalls, wider, mostly paved walkways and better air circulation. Retailers will use any space available to display their goods including nearby vehicles! Kantamanto is an incredibly lively, densely populated area. 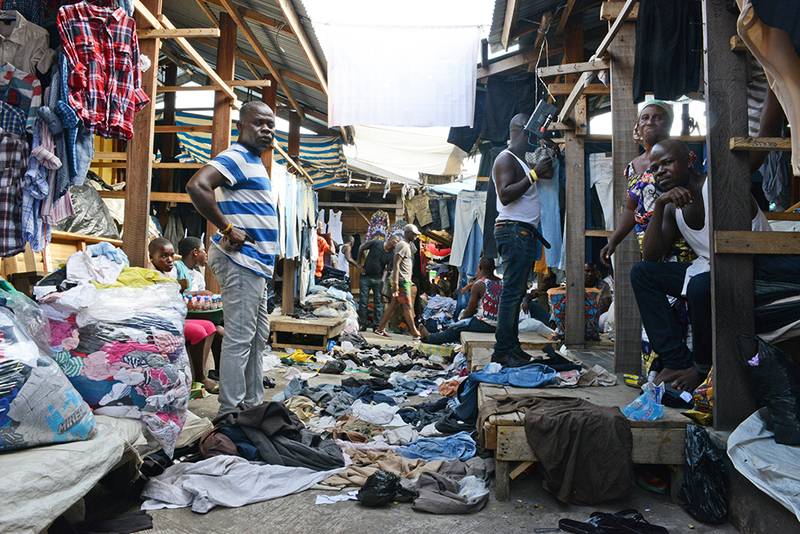 According to government records, Kantamanto Market is roughly six acres in size with up to 30,000 people working there (most of whom are engaged in the "second hand" clothing trade). 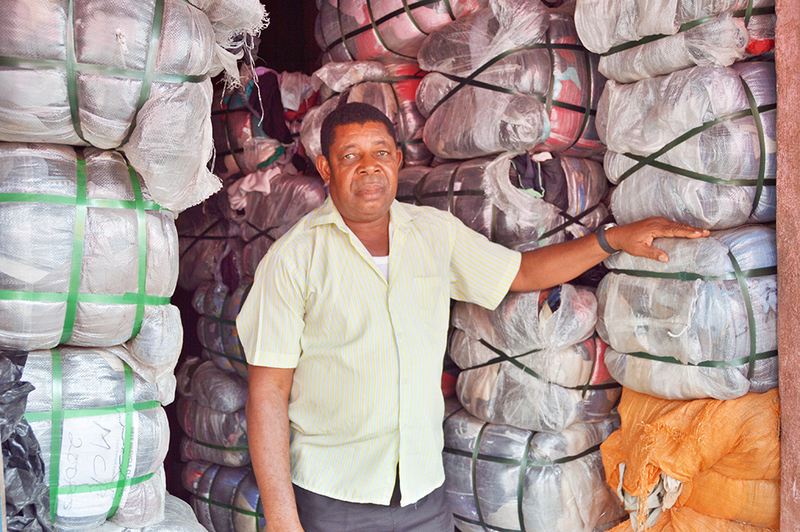 An importer waits for retailers to come purchase bales. 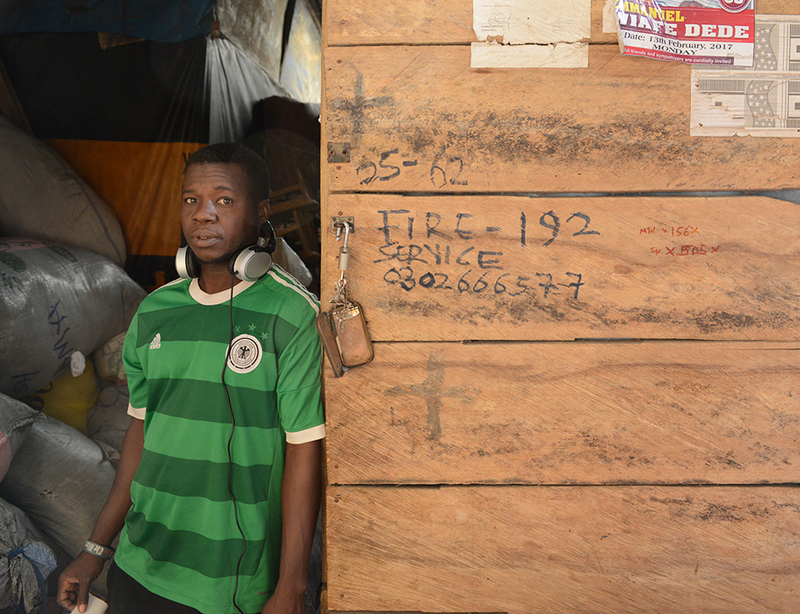 Retailers open bales early on Wednesdays and Saturdays, which are market days in Ghana. This is a stressful and exciting time. Retailers hope for a 'good' bale. Customers stand by eager to pick up the best items. 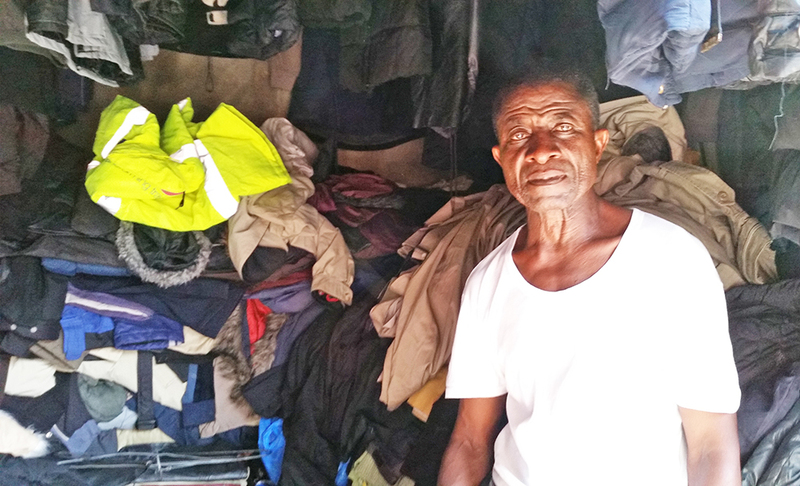 While many customers are looking for their next outfit, some of the early morning shoppers own boutiques outside of the market or work as stylists curating items for clients who do not want to sort through Kantamanto's piles of clothes themselves. 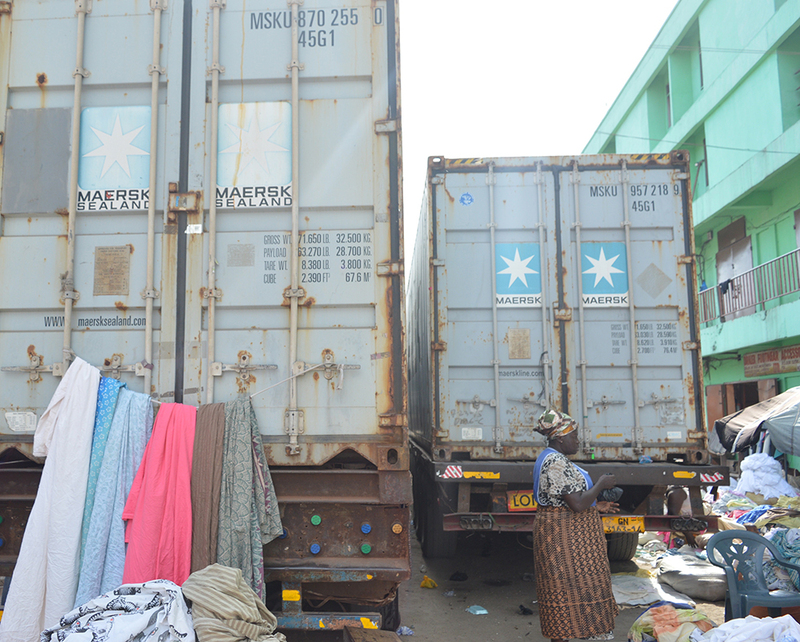 Once a retailer has purchased bales from an importer, she’ll pay a kayayo to carry the bales to a storage unit. 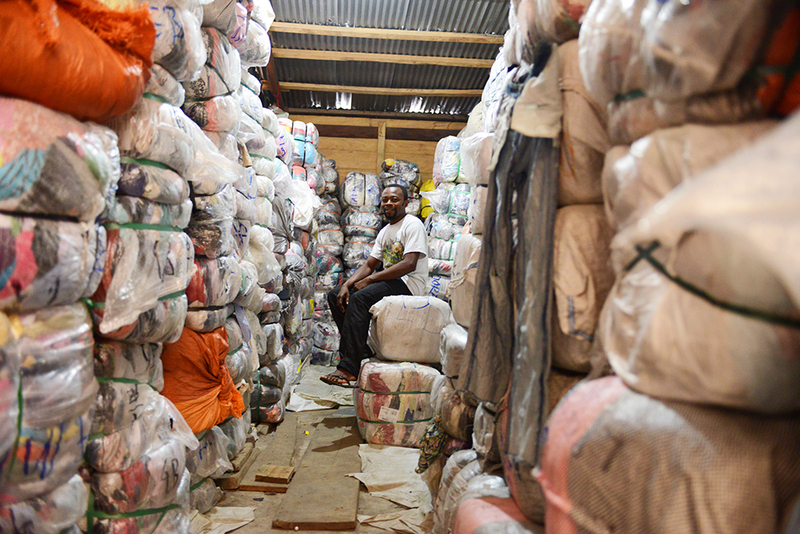 Storage costs roughly 3GHS per bale per week. Some retailers buy only one bale a week. Others may buy 10. 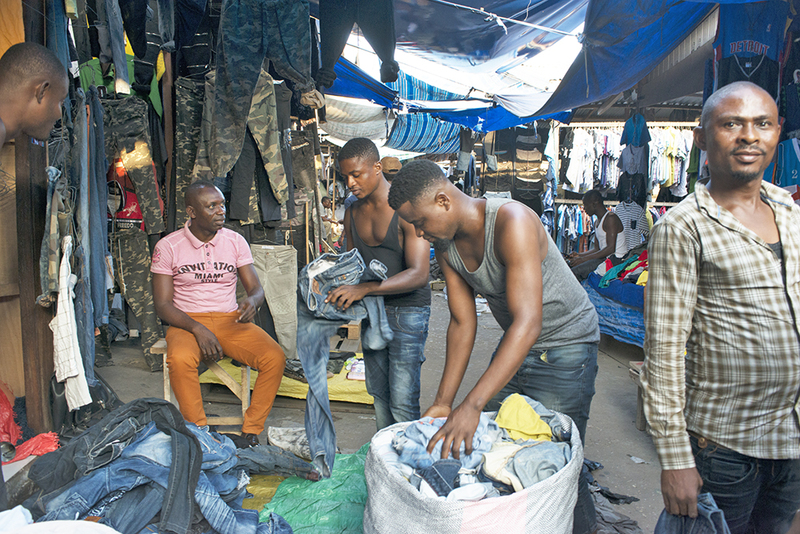 Retailers have different strategies based on how long they’ve been in the market, their relationship with importers, access to capital and import trends related to the type of garment they sell. 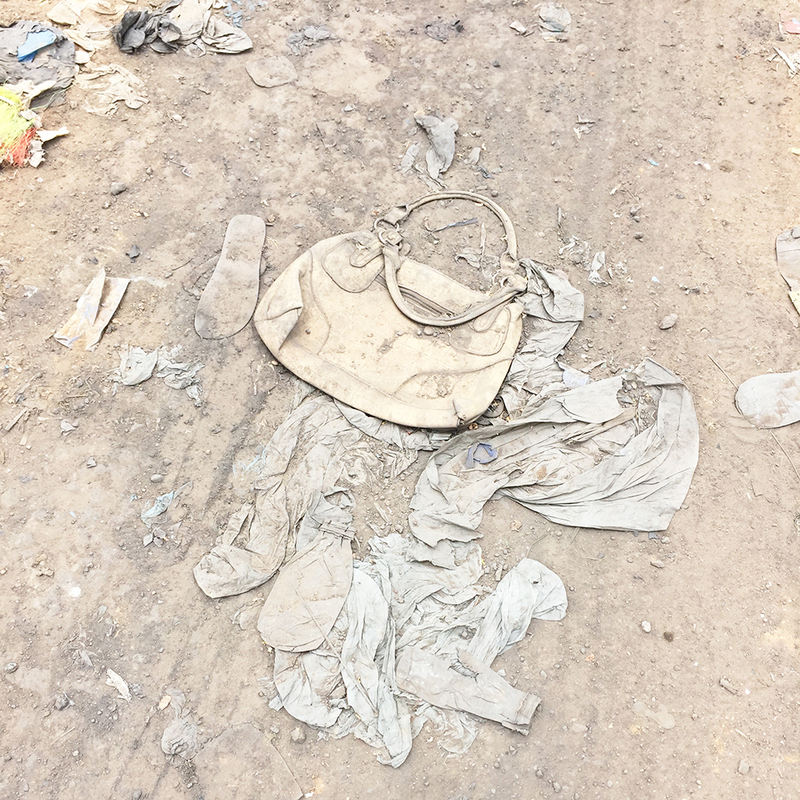 Clothing falls from dump trucks as it makes its way to the Kpone Landfill in Tema. 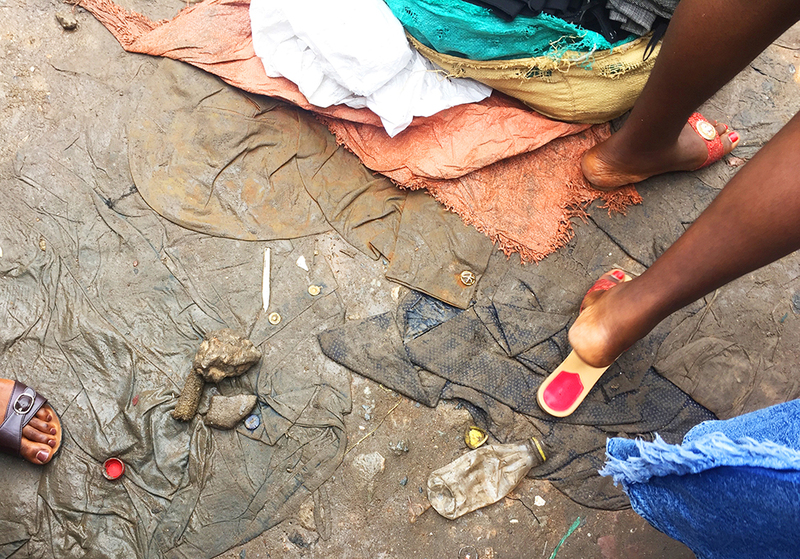 A minimum of 100 metric tons of clothing is taken from Kantamanto Market to this landfill every day, six days a week. This is Yaa. Many of the traders who have worked in Kantamanto for over a decade, like Yaa, choose to become middle men/women, buying several bales a week and selling them on to a small group of fellow traders. A retailer waits for the end of market day. 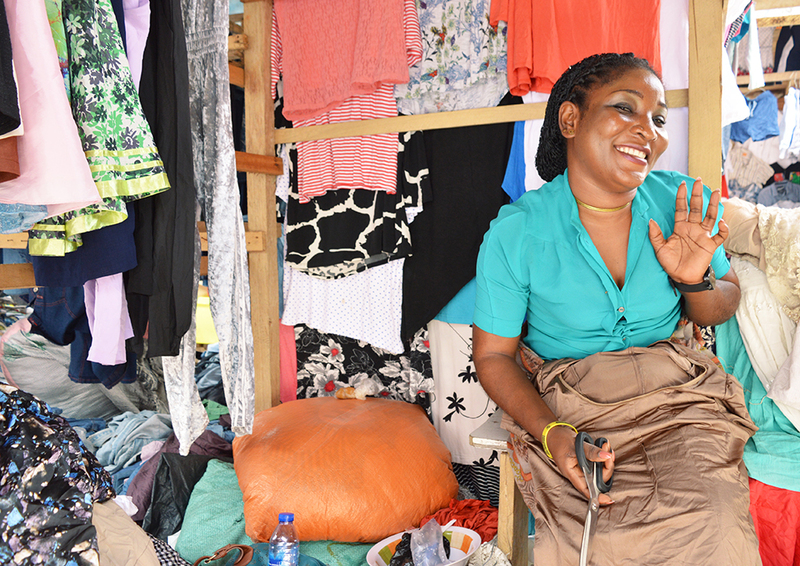 Kantamanto Market is a vibrant place. There are several formal and informal restaurants that serve the people of Kantamanto. These restaurants cook with open flames. This, along with haphazard electrical wiring, densely packed clothing and makeshift construction contributes to frequent fires. In May, 2013 an early morning fire destroyed nearly the entire market and all of the clothing inside. 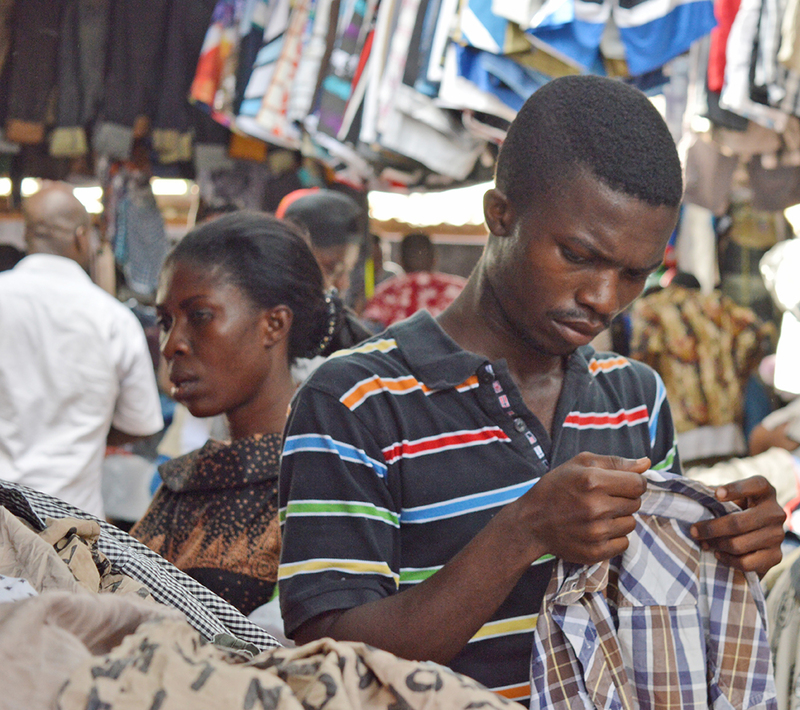 The majority of retailers chose to return to Kantamanto to rebuild their business. 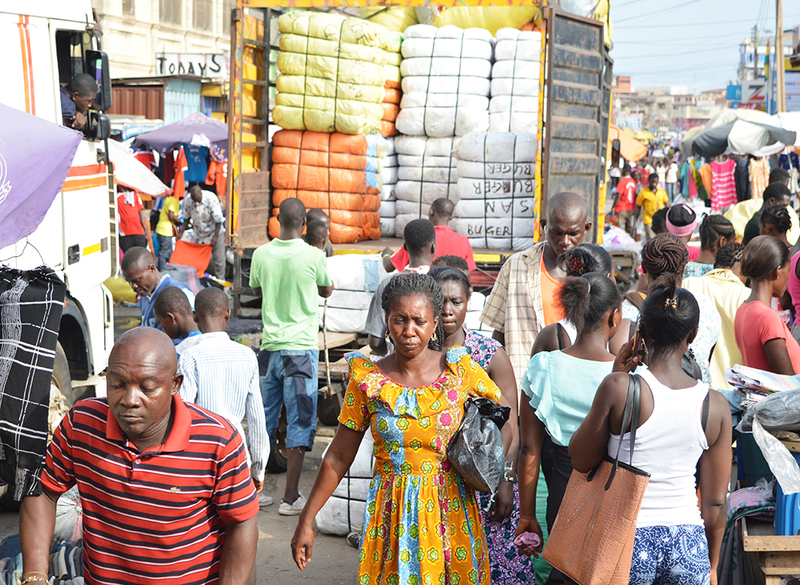 Ghanaian importers work closely with the exporters in Europe, North America and Asia, often times as agents employed by or in partnership with foreign exporters. Bales of clothing are shipped across oceans in 40’ containers. Each containers is packed with roughly 400 bales. 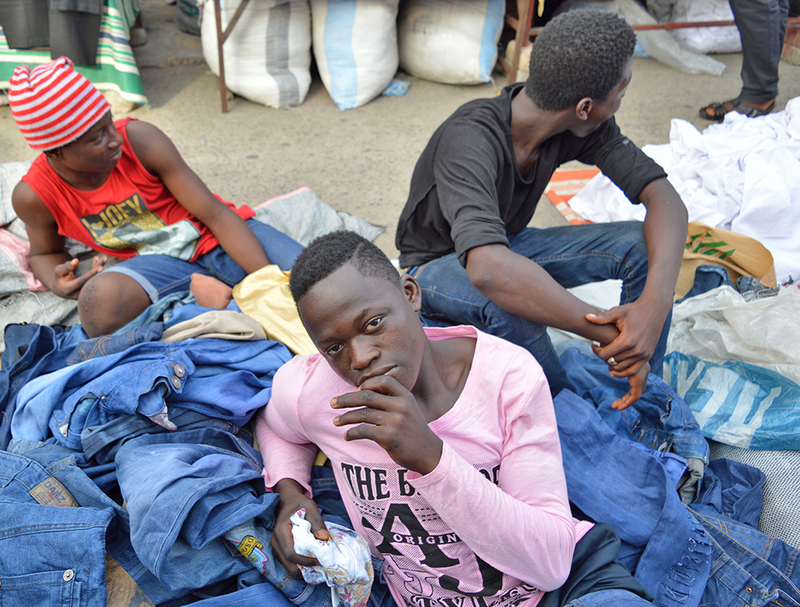 These young men take a break resting on the clothing they have been tasked with selling that day. Retailers often hire younger men and women to take second and third selection product (the less desirable) to the curbside to attract consumers with low prices. 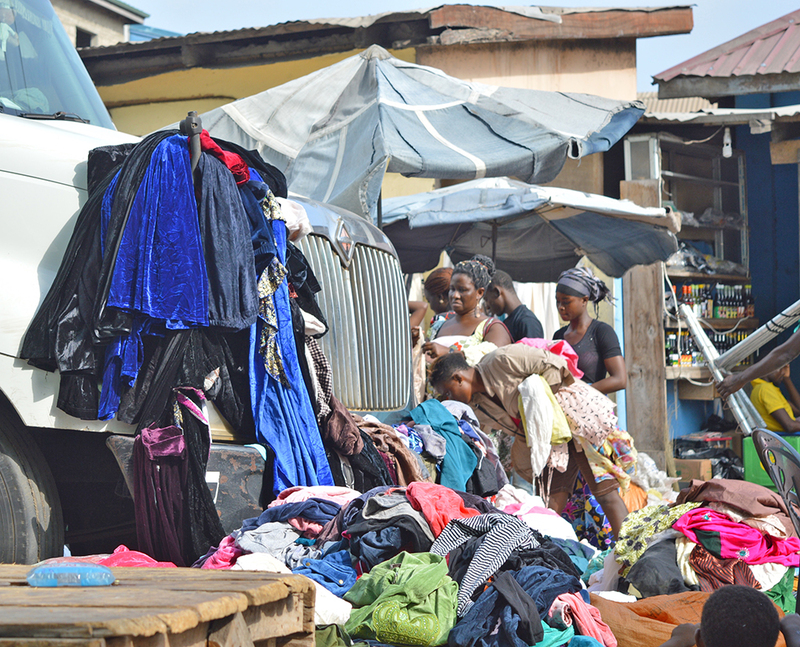 This part of the market is called 'bend-down' because the clothing is on the ground. 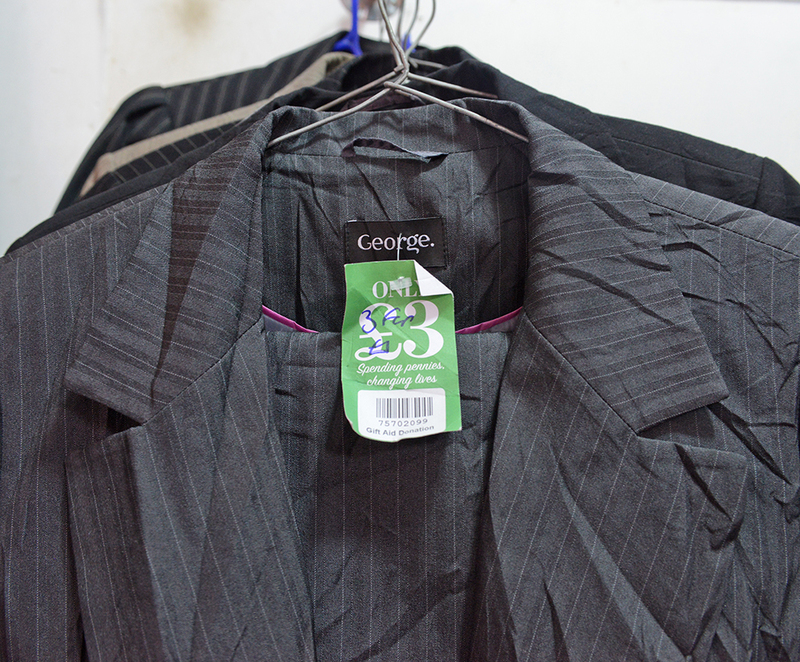 Clothing coming with tags, whether 'original' or from a thrift store, are treasured by retailers. These tags increase perceived value regardless of the price listed. 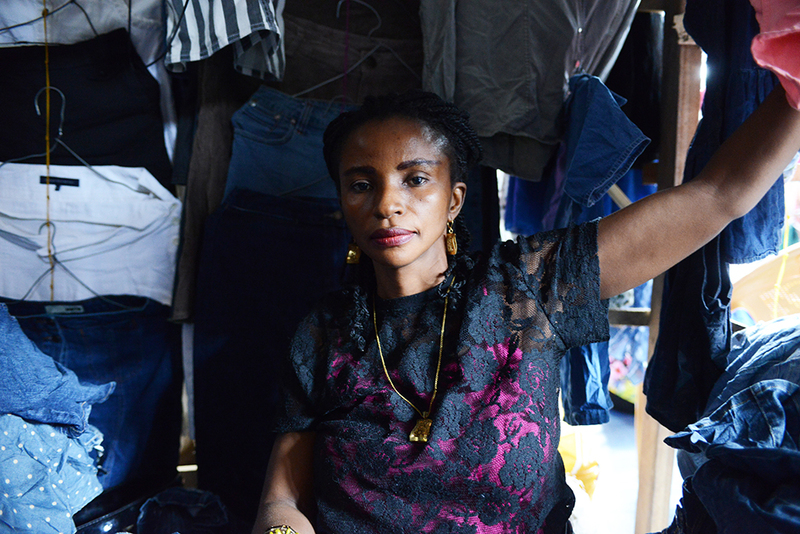 Beyond second hand clothing, Kantamanto is home to an increasing amount of clothing manufactured in China to compete with second hand clothing. These goods are considered inferior to second hand clothing coming from Europe and North America so preserved price tags also function as symbols of authenticity. Bales are unloaded while the market is in full swing. 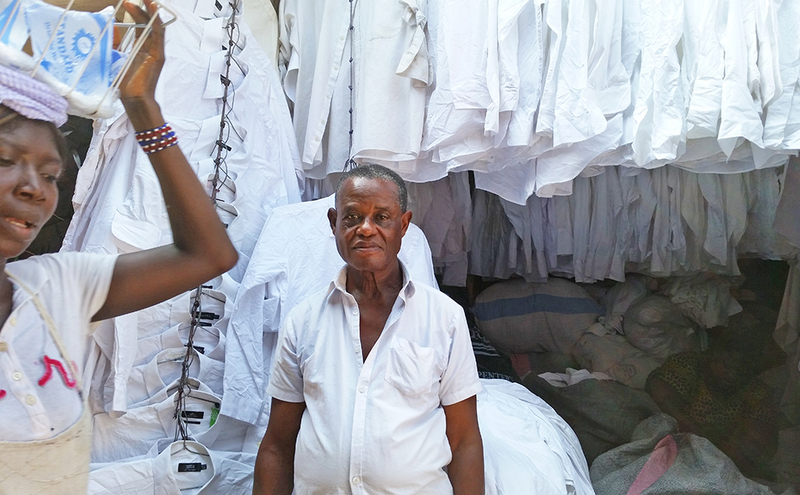 According to our data, white button-down shirts are one of the more secure businesses in Kantamanto. This is because of increased demand for 'professional' attire as well as school uniforms. Such a dress code of 'professionalism' is heavily influenced by standards held by the Global North. 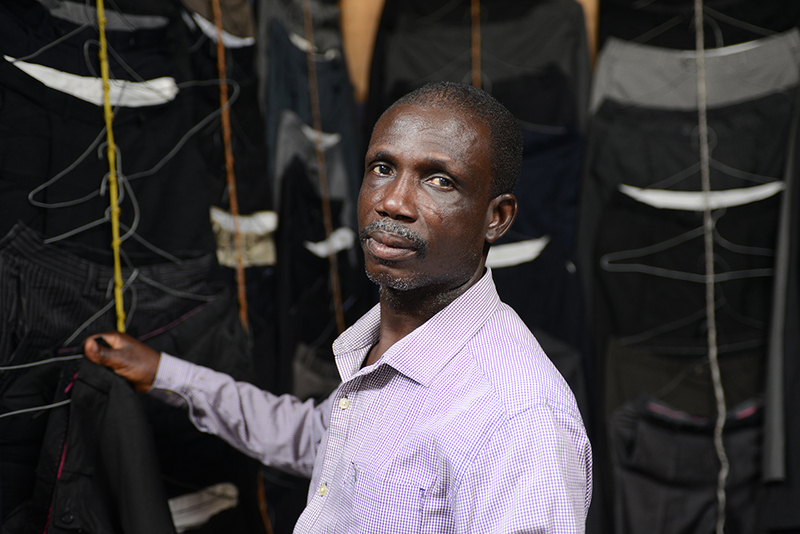 How does this impact Ghanaian textile and garment manufacturing? Customers sort through second selection denim looking for items they can alter to make more stylish. During school holidays the market is full of children who accompany their parents to learn about the business of selling second hand clothing. Lifting 55-100kg (120-240lb.) bales is intense exercise, but the oppressive and repetitive weight can permanently injure the kayayei and carriers in the market. 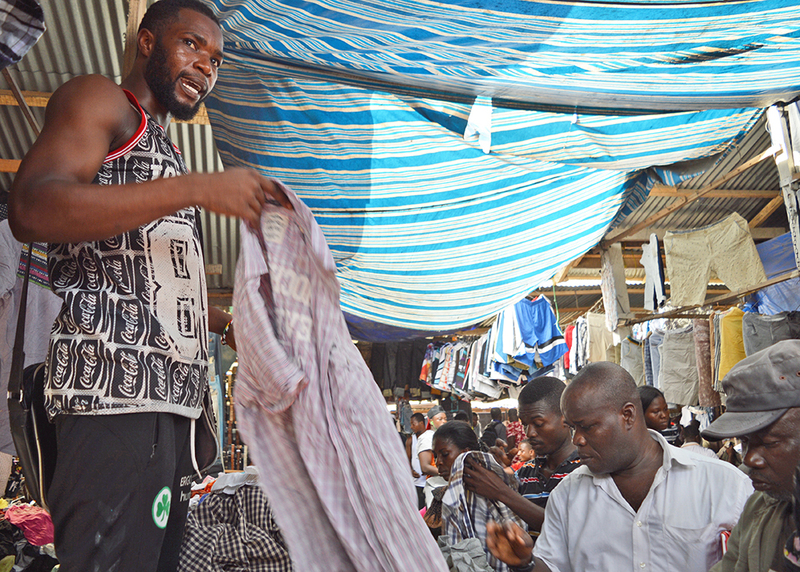 Not everyone has the time or energy to navigate the vast Kantamanto Market so some traders will take to the streets of Accra selling clothing to people as they drive or walk by. Some families form a relationship with these traders and invite them into their home once or twice a month for s private shopping experience. 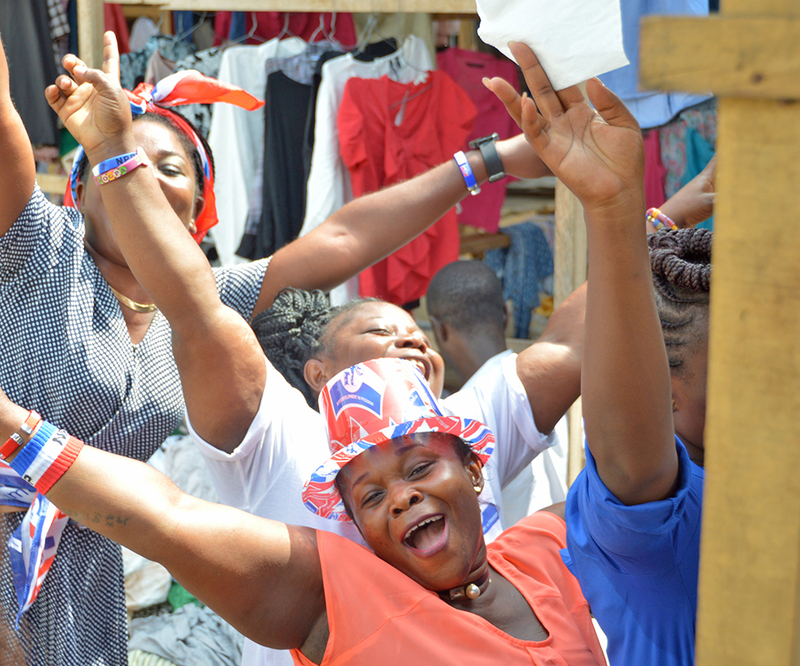 Retailers celebrate the election of President Nana Akufo-Addo on December 10th, 2016. 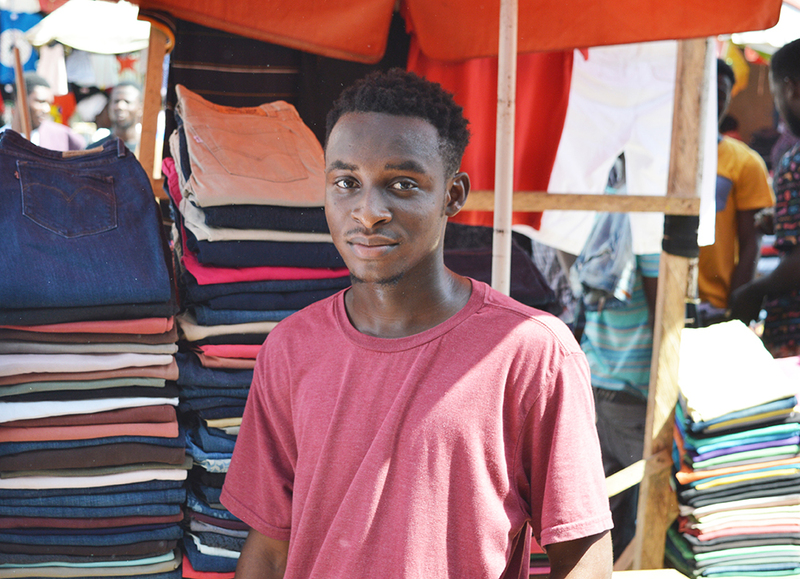 T-shirts are one of the toughest items to sell because many come bearing graphics for brands, charities and events that mean little to people in Ghana. Single use t-shirts - those printed for a specific event like a 5K Run - are likely to end up in landfill. Retailers pack their unsold goods at the end of every day. If they do not have a gated stall they must pay to store the clothing, which is often packed in rice sacks. 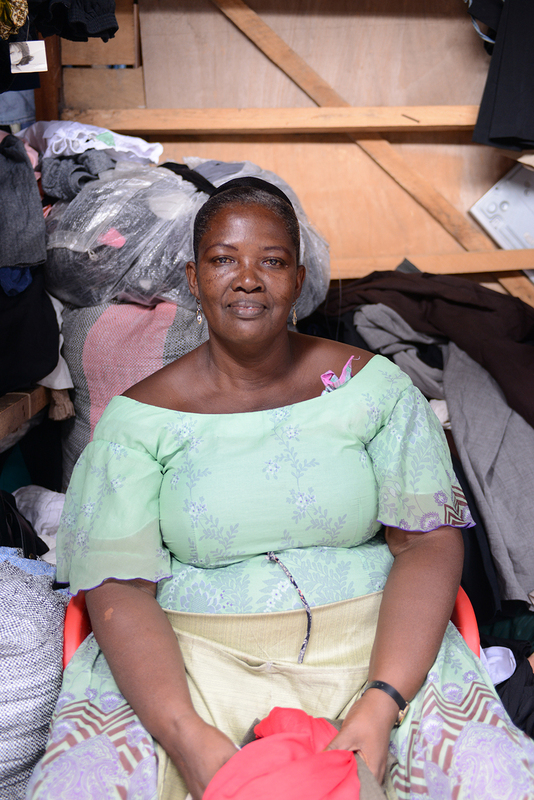 Abena sells ladies dresses from Korea and the UK but she finds that the sizing of clothing coming from Korea works better for her clients. Here she snips loose threads from a dress. 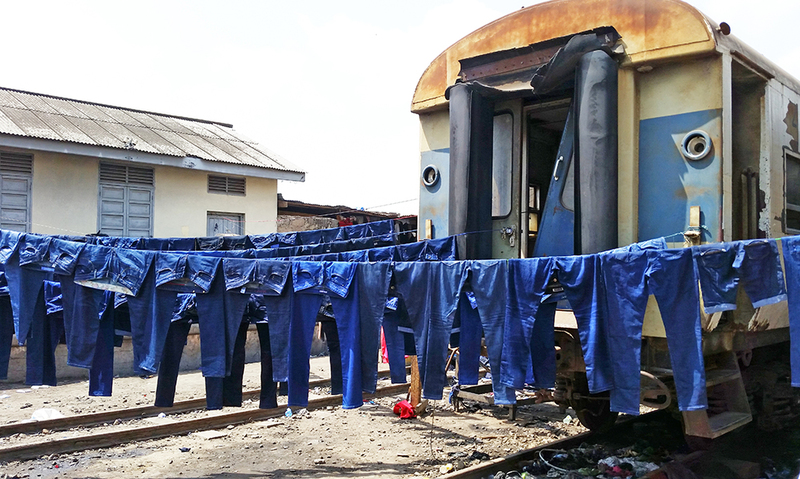 Second and third selection jeans that have been dyed dark blue are set out to dry by the railroad that runs through the 'new part' of Kantamanto. 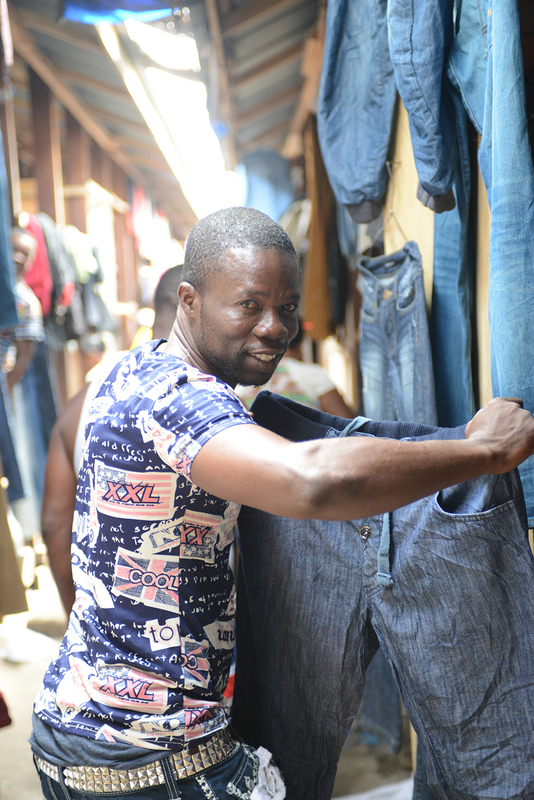 Solomon shows off his collection of first selection jeans. He keeps up with trends via Facebook and Instagram. In 2017, Solomon was looking for the jogger cut and jeans with contrasting stitching. Market days are tense because retailers do not know what they will get when they open their bale. Many do not get enough first and second selection to make back the money they paid for the bale. 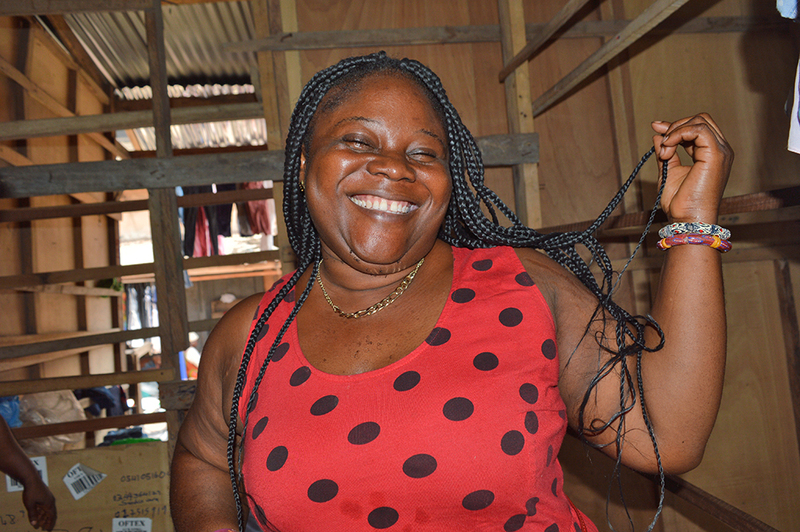 This woman recently opened a bale that was spoiled by mold and cigarettes which meant that she would not make her money back. She would have to borrow money to gamble on another bale. At the end of every day retailers bags up or throw the clothing they cannot sell into the aisle ways to be picked up and sent to landfill. You can find everything in Kantamanto from Supreme t-shirts to vintage coveralls. While this is the only retailer dedicated to selling winter coats there is steady demand especially for Ghanaians traveling abroad. 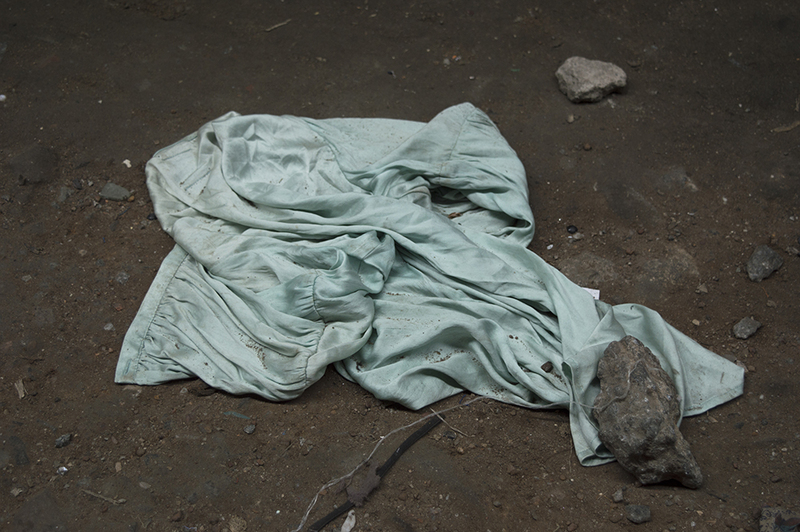 This dress has been discarded and is destined for landfill. 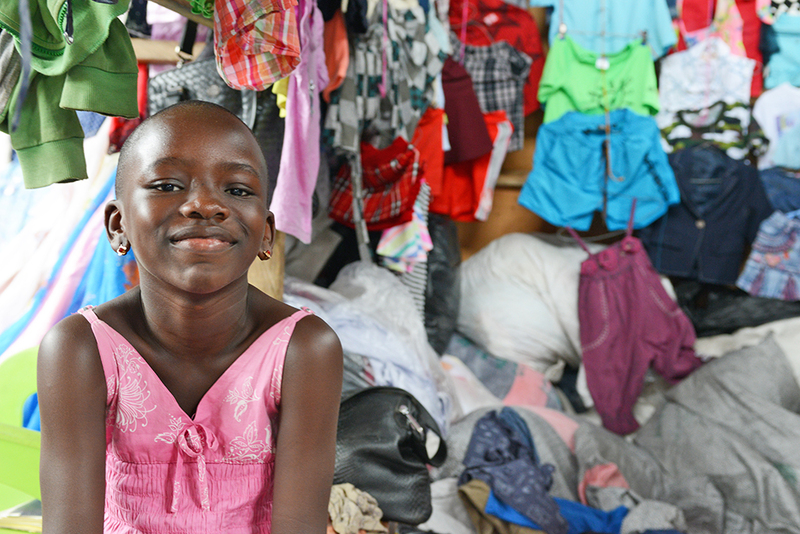 Around 2 million pounds (possibly more) of clothing is sent to landfill from Kantamanto Market on a weekly basis.